In today's version of "The Chart That Sank 1,000 Markets", we look at one of the Philly Fed's lesser-known indices, and how it is flashing red right now. The last four times the CEA Index hit exactly the level it's currently at, 2.5, economic calamity followed. 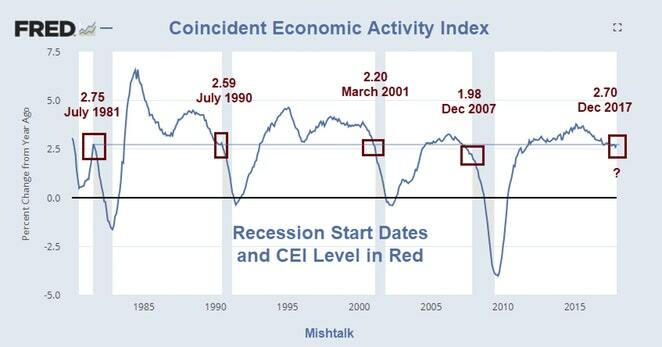 The Coincident Economic Activity Index is produced monthly by the Philadelphia Fed. On a year-over-year basis, recessions have started when the year-over-year CEI was around 2.5 percent. The coincident indexes combine four state-level indicators to summarize current economic conditions in a single statistic. The four state-level variables in each coincident index are nonfarm payroll employment, average hours worked in manufacturing by production workers, the unemployment rate, and wage and salary disbursements deflated by the consumer price index (U.S. city average). The trend for each state’s index is set to the trend of its gross domestic product (GDP), so long-term growth in the state’s index matches long-term growth in its GDP.